I was sent these items for review. All opinions are mine alone. If you follow along on Instagram, you probably already know that I’ve been trying out some Lancome products that were sent to me. Lancome is one of my favorite brands of makeup. I haven’t used a ton of their skincare products, but I do have some faves. Their Tonique Radiance toner and Bienfait day moisturizer are very nice. They’re definitely on my list of items to repurchased in the future. My original plan was to try out the products on my Instastory to share the progress of the facial treatment I was sent. 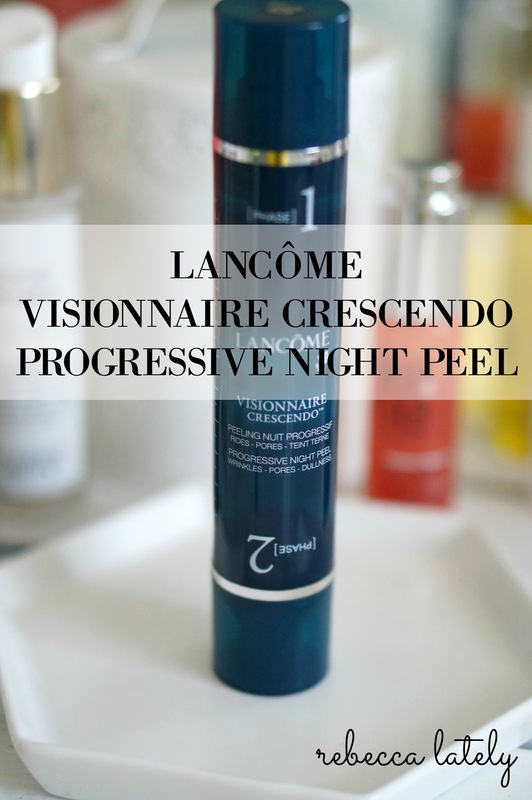 They sent me the Lancome Crescendo Visionnaire Progressive Peel, which is part of their very popular Visionnaire line. The Visionnaire line works to reduce the appearance of fine lines, wrinkles, and pores. All of their claims sounds good to me. Just to give you a little background on my skin, I have combination/oily skin that is dehydrated, very sensitive, and acne prone. What a mouthful! Over the years, I’ve found a lot of products that work for my skin. Last year, I started using the Sunday Riley Luna Sleeping Night Oil with their Good Genes Treatment. It was amazing. It was so amazing, in fact, that I splashed out for the ginormous, yet somewhat economical, large size of the Good Genes Treatment. At $158 for 1.7 ounces, it’s a deal compared to the smaller version at $105 for 1 ounce. I realize how ridiculous this sounds. Just bear with me. When you find a product that stops your skin from breaking out, you just work it into your budget somehow. In case you’ve never heard of this treatment, it has two phases. The first phase contains gentle fruit acids that exfoliate your skin. They are gentle, so your skin gets used to the topical exfoliation. After the 14th night, you switch to the second phase. The second phase contains AHAs (alpha hydroxy acid) and BHAs (beta hydroxy acid, basically salicylic acid), so it’s intensely exfoliating your skin. At the end of the treatment, you should have glowing, radiant, smooth skin. The funny thing is, the first phase actually made my skin look amazing. I got through 3 1/2 nights of the treatment, and every morning I woke up to smooth, radiant skin … along with a few ugly acne spots. My chin and jaw areas were breaking out so bad. In retrospect, I believe it was due to halting the Good Genes Treatment. The last time I stopped using Good Genes, my face broke out pretty bad. However, I think my skin would’ve calmed down had I made it to the second phase. My skin is used to topical exfoliation, and the second phase contains the acids that I normally include in my skincare routine. But, I just couldn’t make it past the fourth night. The scent of this treatment is so strong. If strong scents don’t bother you, then this treatment might work. I am so sensitive to strong, perfumey scents that this did not work. It was so bad that I had a headache most of last weekend. It doesn’t just affect my head, because my sinuses feel so inflamed and painful as well. On the fourth night, I washed it off before I went to sleep. The reviews for this product are all over the place. People either love it or hate it. Some of reviews are pretty bad, and they have pictures to go along. My breakouts were nothing compared to some of the pictures I saw. The frustrating aspect is that I do think this is an effective treatment, based on the 3 mornings that I woke up to perfectly glowy, smooth skin. It’s just not worth the literal headache of applying it for 28 nights in a row. If you’re going to try this, be aware that the fragrance might smell strong to you. Everyone is different when it comes to scent, so I would go by a Lancome counter and take a whiff before paying $75 for this treatment. That’s a hefty price tag for something that might not work.